The Oyster Bar in Grand Central Station epitomises New York for me, so it’s fitting that our last meal would be an early lunch here before we head for the airport. Every time we visit we sit up at the bar so we can watch the theatre. It smells clean and salty like a beach. The unopened oysters are stacked in metal bins under ice. The oysters shuckers are quick with the knife and the oysters flick open. 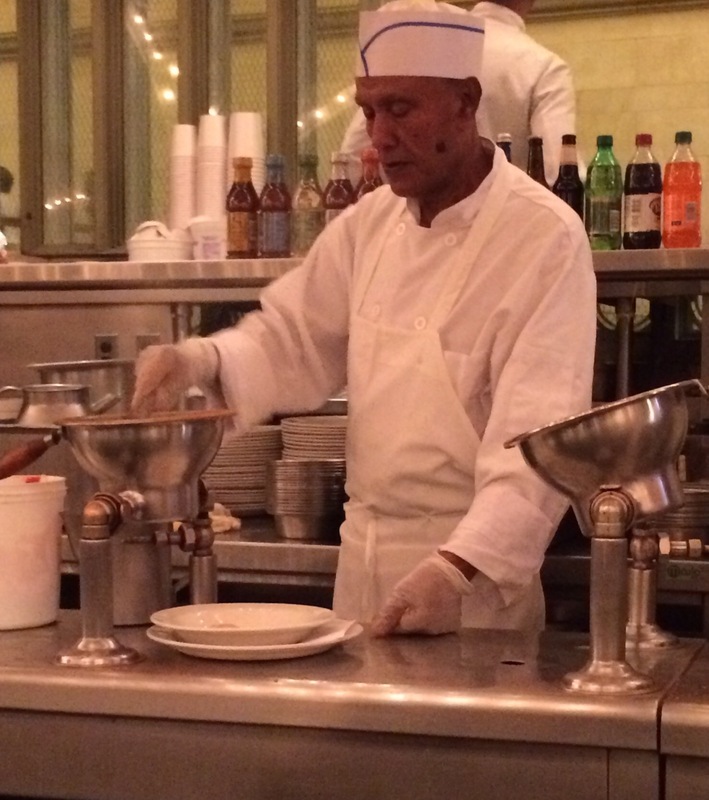 One man’s job is to cook bowl after bowl of seafood chowder in two metal contraptions more suited to a science lab. We get whiffs of creamy seafood stew when he pours it into the bowls. The steam billows up around him like the steam from the road grids in Manhattan. We always order the same thing: a glass of champagne and a mixed dozen oysters each. The varieties of oysters make us east coast Australians drool: Belon from Maine, Blue Diamonds from Washington, Cuttyhunk from Massachuesetts, and the list comes out at more than a dozen. But it’s not just for us that we keep coming back here. Once we took a dear friend there knowing he would love it. 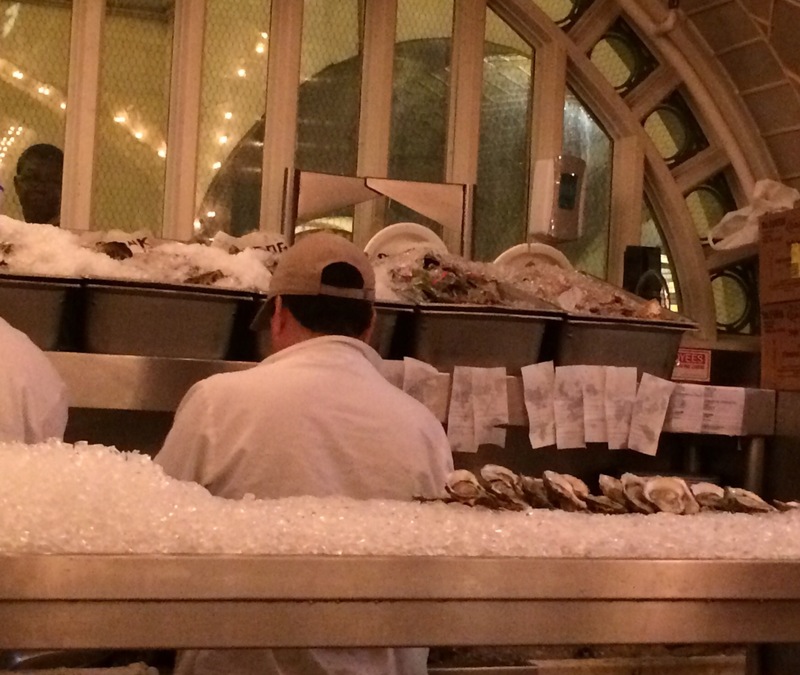 The Oyster Bar became one of his favourite places in New York too. Sadly he died a few years ago. Today it feels as if he is sitting up at the bar with us, slurping the salty oysters through his teeth, holding up his glass for yet another toast to some wonderful aspect of our lives, just as he did in that one long fabulous lunch we shared here. Here, more strongly than anywhere else, I’m reminded of him. This entry was posted in New York, Travel and tagged friendship, Grand Central Station, loss, New York, Oyster Bar, travel. Bookmark the permalink. What a lovely way to honour the life of a departed friend, Karen. But my irreverent side has also kicked in – my mouth’s watering! Safe travels. Thanks, Diana. Merry Christmas and wishing you many oysters in the coming year! Thank you for your posts during 2015 they have allowed me to travel the world from my couch and at my age that is allowed. Have a Merry Christmas and may 2016 bring you Good Health and Happiness. Thank you for your lovely comment and well wishes, Bobbie. It’s been a pleasure to have you along on the trips. Merry Christmas and a happy and healthy new year to you, too. Thank you for sharing Biggins. I have shared this setting,and it’s oysters with a friend also. It was his first visit to NY. Dustin, fell in love with the city and became a resident, 12 years ago. Central station’s oyster bar, it’s bustling scenery and the pearl artisans, bring back memories that make my mouth water and crave the delicacy shared there. Thanks for sharing that lovely memory, Joshlynn. I completely understand the appeal. And thank you so much for commenting.